Derived from English and American styles that revived elements from the architecture of Queen Anne’s reign (1702-14), these picturesque houses are deliberately complex, creating a kind of vigorous grandeur. Most of these houses are freestanding and set well back from the street. Houses usually have complex roof forms and asymmetrical floor plans. The roof form is a key feature of these houses. Queen Anne was neither an architect, nor a passionate proponent of architecture, but the Queen Anne style revives architectural details reminiscent of the buildings around at her time. 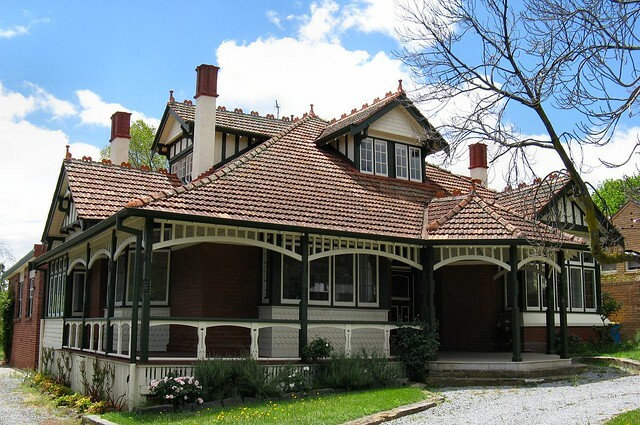 Both Britain and America have Queen Anne revival architecture, and although similar, the Australian variety is quite unique. 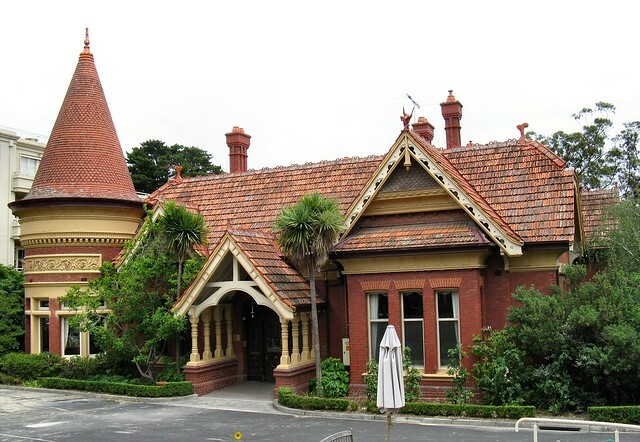 In Australia, Queen Anne refers to an eclectic style of red brick buildings with ornate detailing and old-world elegance. 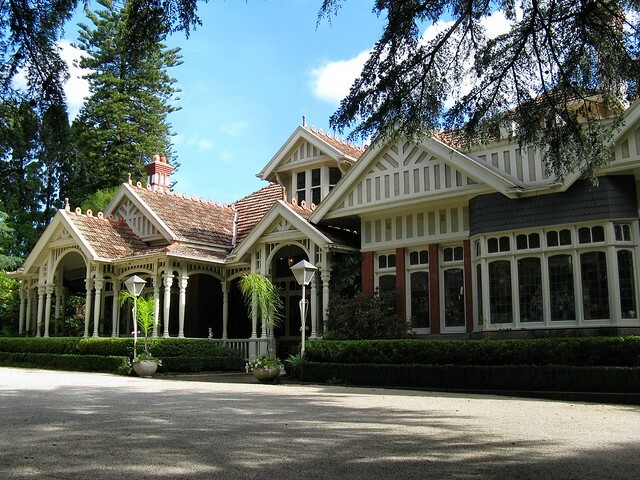 A Queen Anne Style house located on Appian Way in the Burwood suburb of Sydney. 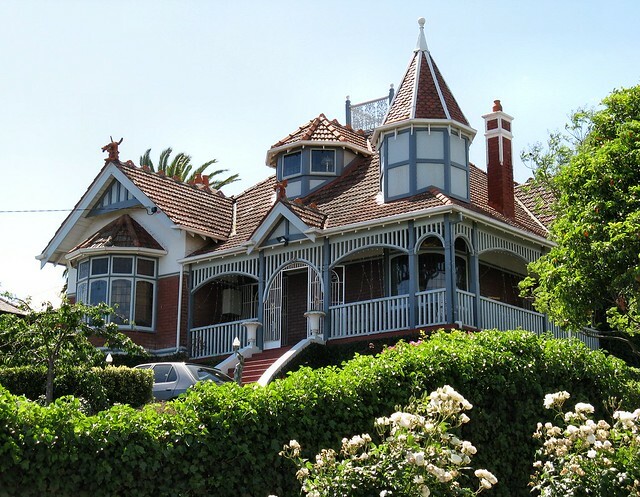 The Queen Anne style is romantic, picturesque architecture. 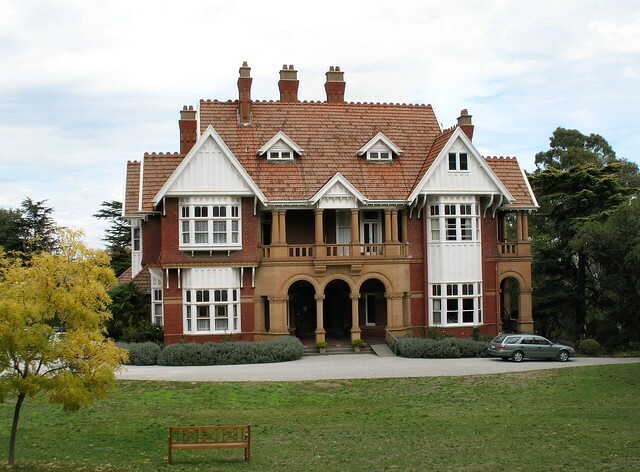 The complex rooflines with terracotta chimney pots are the most striking feature of the style. Steeply pitched and complex, Queen Anne roofs provided visual interest and variety with gables, dormers, and turrets or towers, often all in one roof. 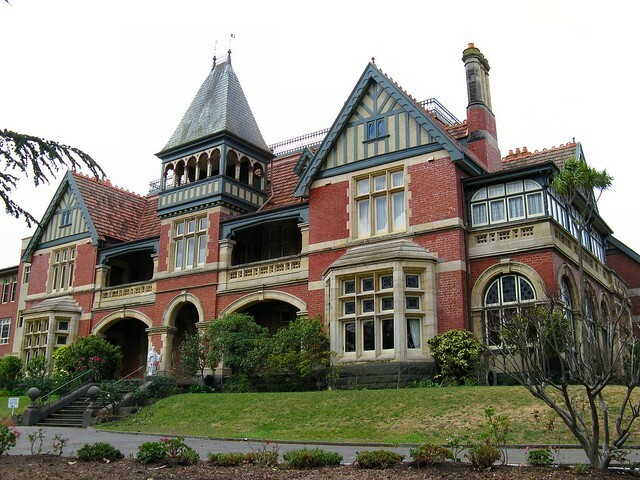 “One of the finest houses in Melbourne, is the residence of Alexander McCracken,!Woodlands‘, (now St Coumban’s Missionary Society). It combines brick, stone, timber, slates and terra cotta tiles in a powerful ensemble. At the time it was built it was claimed to be the first building to make extensive use of terracotta tiles imported from Marseilles. 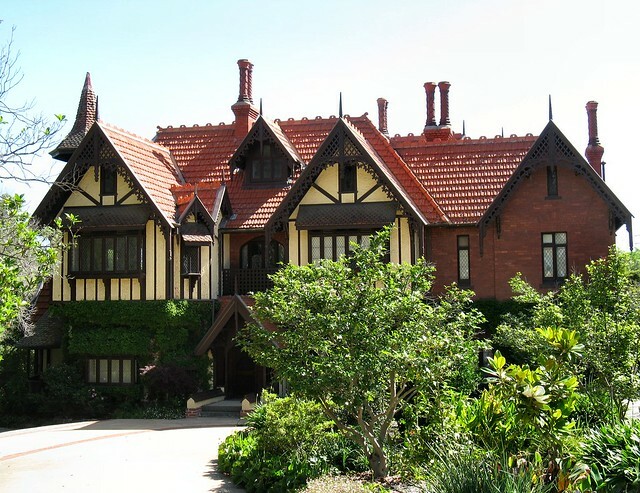 Wunderlich Bros started to introduce terracotta roof tiles from France and continued until 1914. Red tiled roofs came to be quintessentially a Federation feature. A Federation house can be easily identified by the shape of the roof. a short broken hip leading to the short ridge line which ran across the house. Two small triangular roof gable vents were installed at either end of the ridge. The roof to the rear was either a low pitch skillion or a lower pitch corrugated iron clad roof. The ceilings were always set down by 1 foot (300mm) at the end of the rear pitched roof. In the gable genre the walls, especially in a two storey design such as ÐaIswraith, were dominant elements and were carefully treated as a visually important aspect of the design. with the walls in the hipped genre rising no higher than the ground floor eaves, and the perimeter being softened with screens of turned timber posts and. arched infils to the porches and verandahs. Unlike the model of the Old English Style’ whích exhibits a two storey wall surface, such. as at Dalswraith, these examples have a sublime sweep of roof running down to form a ground floor eaves, so that in parts, only a single storey of waII at ground level is revealed. to the eye. They share this characteristic with the hip genre shortly to be discussed. However, unlike the ‘hip genre’ at the gable ends the walls majestically rise through the ground and the first froor right up to the apex of the gable. In the hipped genre a dominant hip roof envelopes the whole house out of which subsidiary gables or hips and turrets emerge. The surface of the hip roof is continuous with the roofs of any verand.ahs and. porches associated with the house. rn many of thése houses, the roof sweeps down to the single storey perimeter wal1s with the first floor enveloped within the roof, its rooms expressed by the protruding gables. It is the sweep of the roof, the subsidiary gables, the finials and cresting, and, above all, the colour and texture of the orginal Marseilles tiles, which dominates the eye. In order to accommodate the upper floor rooms within the hip roof, it was necessary to have a fine spread of rooms on the ground floor. 3. An assynmetrical two storey house with the diverse array of gables kept to the first floor eaves line. Residence and Surgery for Mrs D F Laidlow (1904).